The Mitsubishi RVR (Recreational Vehicle Runner), aka the Mitsubishi Expo LRV/Eagle Summit Wagon/Plymouth Colt Vista, was a mini minivan. It was a practical and frugal vehicle,especially with the diesel option. 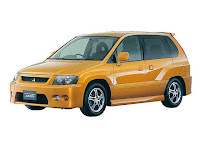 Then there was the RVR Hyper Sportsgear R.
The RVR Hyper Sports Gear, or HSG, was essentially a tall Mitsubishi Evolution III with a sliding door. It was powered by the renowned 4G63T making 220ps or about 217 horsepower, which went to an all-wheel drive system. This was slightly detuned from the EVO III, but not much. 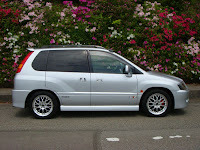 The HSG came with Recaro seats and distinguishing bodywork, including that trademark front end and spoiler. There was an external spare tire option, too. 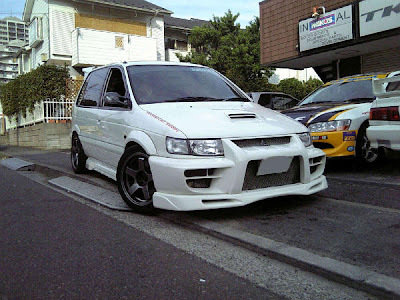 It was kinda rally car, kinda minivan, kinda strange, and totally unique. There was a bodystyle change in 1997, and the HSG went away. However, the RVR Sports Gear X3 was available with the 4G63T again, this time making about 250ps (246 hp). It wasn't as radical looking as the first-gen, but it surely still had plenty of power (see the two pics below, top row). Apparently, these vehicles have a cult following in Japan, Australia, and parts of Europe. I had a '92 Mitsubishi Expo LRV, and someday would love to have a 4G63T-powered Expo. Add it to the list of dream projects. 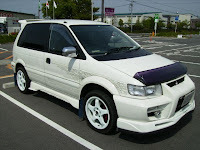 You can find some info about the RVR HSG on some Mitsubishi Evolution forums, especially those in Australia, but unless you read Japanese, info on these is kind of sparse otherwise. Regardless, the RVR HSG is one of my all-time favorite vehicles if not simply for the irony of a tall-wagon with more than 200 turbocharged horsepower ... and a sliding door.